Lock in a great price for Fort Young Hotel - rated 8.2 by recent guests. They have nothing ., The pool is freezing cold. Dirty tables where people have left .. Just dis organized. Lovely big bed and sizeable bathroom, great views & helpful staff, lovely breakfast - nice black pudding & souse! Great location with amazing pool looking over the sea. Food in the restaurant was very good. Wonderful view of the southwestern coastline of the country and of the various cruisers changing everyday; perfect location to all the docks as well as every corner of the capital; delicious dinner; warm-heartedly helpful and responsible staff; comfortable bed. The hotel is fine the charges is too high for all yo Ofer. Despite not operating at full capacity as a result of the Hurricane last year, the experience was wonderful. I’ve been going there for years and the changes didn’t make me feel inconvenienced in any way. Front desk and restaurant staff were amazing. Lovely old 16th Century Fort converted to a modern hotel. The old Fort buildings stood up to the hurricane better than the new buildings. I think the pool was the best I have ever experienced. Located in front of the Caribbean Sea and 0.7 miles from Roseau City, Dominica hotel offers on-site dining, a spa and an outdoor infinity pool. Every room at Fort Young Hotel features a private balcony. Guests can enjoy water sports such as diving. They can relax in the hot tub or work out in the fitness centre. They can also visit the on-site duty free shops. Hotel Fort Young’s bright, contemporary rooms offer free Wi-Fi, cable TV and a desk. They include a safety deposit box, a ceiling fan, a small refrigerator and ironing facilities. Ocean front rooms are available. The Waterfront Restaurant is open daily for breakfast, lunch and dinner. On Monday nights, the Warmer's Bar located on the boardwalk serves a dinner buffet with Caribbean specialties. Balas Bar is also on site and well known for its rum punch and cocktails. The Dominica Museum is just 200 yards from this hotel. Morne Trois Pitons National Park and Victoria Falls are less than 30 minutes’ drive away. This property also has one of the best-rated locations in Roseau! Guests are happier about it compared to other properties in the area. Fort Young Hotel has been welcoming Booking.com guests since 14 Aug 2006. When would you like to stay at Fort Young Hotel? This room offers a balcony and cable TV. Please note that the occupancy is for 2 adults or 1 adult and 1 child. This room features an ocean front balcony and a flat-screen cable TV. It also offers a fridge, coffee-making facilities and bathrobes. This spacious room features an ocean front balcony and a flat-screen cable TV. It also offers coffee-making facilities and bathrobes. This hotel was built in 1964 within an actual British Fort and named after Colonel Young who was in command of the fort in 1771. In 1979 after the devastation of Hurricane David, the fort rooms, which was part of the original structure was repaired along with the addition of our Oceanfront rooms. The original stone walls and restored cannons are on site if u wish to take a walk back into history. Its a one of a kind hotel with friendly staff and a welcoming atmosphere. Welcome to Fort Young Hotel. In efforts to deliver a quality product to our guest, we are constantly looking at ways to improve. In light of this, through October 2018, we will be undergoing renovation in respective areas. During this time, there will be increased noise from construction work between the hours of 8:00am to 5:00pm. In lieu of the spa, in-room massages are available by appointment. The gym will reopen January 2019 and yoga sessions will be offered from April 10, 2018 onward. The Palisades Restaurant will tentatively reopen June 2018. The bar and room-service are available. Thank you for your understanding. House rules Fort Young Hotel takes special requests - add in the next step! All further older children or adults are charged USD 36 per night for extra beds. Fort Young Hotel accepts these cards and reserves the right to temporarily hold an amount prior to arrival. Adults are considered 12 years and older. The property will be going through renovation works from Wed 22 Aug 2018 until Tue 15 Oct 2019. During this period, guests may experience some noise or light disturbances, and some hotel facilities and services may not be available. We had a number of maintenance issues during our stay with the sink and bath which we had to raise twice before anyone came to fix it. 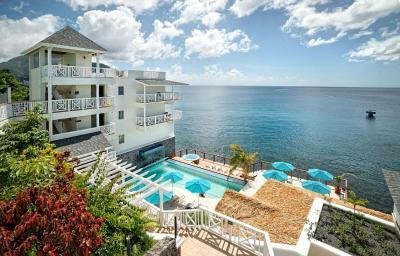 It is a nice hotel but is overpriced when compared to other hotels in Dominica. The location is excellent - you have a front-row seat of the ocean and a chance to see the cruise ships docking (and leaving!). The staff were attentive, especially the security staff who helped us find space to park our car in the rather small car-park a few times. The restaurant has a good selection of choices for vegans and vegetarians. The bar is also very good and there is a dive shop located on the premises. Very overpriced for what it offers. Room, especially bathroom, badly in need of refurbishment. Staff did not engage and were slow to provide service. Handy for meetings in Roseau. Room was spacious. Service in the restaurant was slow. The rooms felt a little bit dated. The service in the restaurant leaves room to improve. The breakfast buffet could add a bit more variety. The staff and location are the best. All the staff was friendly and helpful. They were amazing especially when they were still recovering from Hurrican Maria. Although some of the facilities were not available, such as the gym and some of the walkway were closed due to construction, they tried their best. Keep in mind though, they live on island time and lifestyle, which is more laid back, don't hustle, leave room for your schedule. The location is perfect. It may be a bit confusing due to the construction and the roadblock for the cruise ship. But it is a perfect location for everything and every local knows Fort Young. This is quite an expensive hotel for what it delivers. The bar service is quite slow and the quality of the food not what you would expect for the price or quality of hotel. Good location for downtown Roseau and nice the rooms were quiet. Unavoidable, but the rain soaks the walkways and it can be a little hazardous on the steps. Excellent hotel. most beautiful location and beautifully designed hotel. Friendly staff addressing you by your name always. Delicious food at the on site restaurant. Wi-fi in the southern wing hardly works occasionally maybe due to the reconstruction; opaque charges, e.g. high rate of phone calls from room, that are not shown noticeably anywhere.